It's already that time again? This year has gone by so fast it's crazy! After a ton of crazy fun comic conventions throughout the summer, we are now enter the cool underground art show season! 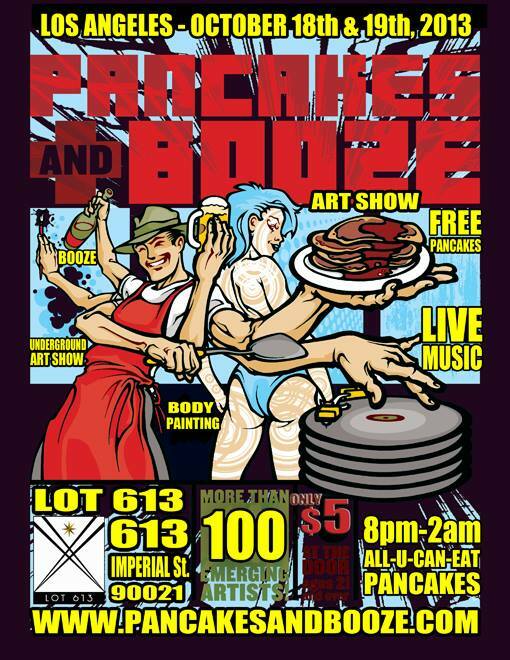 After just completing the Chocolate & Art Show as well as the Zombie Fashion Show and Creature Exhibit this past weekend, we are rounding up on one of my favorite art shows, Pancakes & Boozes! That's right! Two awesome things we like to ingest in one place for just $5! With your ticket in you get access to an all you can eat pancake bar, awesome art and great music. Booze isn't free, but a $5 cover for such a unique event really isn't bad at all. This will be my third time at the event and as far as I'm concerned I'll likely be at every LA area one Tom Kirlin (the guy who created it) throws!